The Online Songbook feature has 2 parts: (1)Online Songbook and (2)Remote Queue Management. When possible, avoid using IE browser (FireFox should work fine). Android and iPhone/iPad browser works fine too. 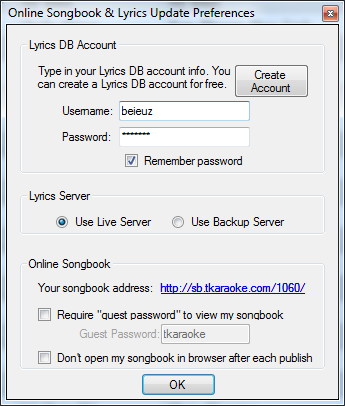 In a few days, TKaraokePro will come out with version v1.5.016 that supports the Online Songbook (OSB) feature. OSB is like having your own mini-lyric database site like the Lyrics DB that is accessible to you and your karaoke guests. Your guests can use any device that support a browser to search for songs currently loaded in your TKaraoke software. We optimize the site for android, iphone3, iphone4, and ipad1/ipad2 but any device that support a browser would work. The goal of the OSB is to avoid printing your song catalog and anytime your song collection change, you can publish your new collection w/o worrying about song numbers re-ordering and/or cost of paper! After you publish your songbook, your Songbook Address will be available under the Preferences screen above. You can then perform search on your song collection using "tên bài hát", "tên ca sĩ", "tên nhạc sĩ", "lời bài hát" or "All of the above". The search will contain the Song Number that your guests can use to add that song into TKaraoke. Q1: Will this Online Songbook be available on the Free version? Q2: Can I add the song to the Song Queue directly using my phone on that "search result" page? Not in v1.5.016. Later Pro versions will support this. Free version will not support this advanced option. Q3: How long does it take to publish my songbook? For 23000 songs, it will take 7 to 12 minutes to publish depending on the load of the Lyric DB server. You only need to publish it once and when your song collection changed (i.e. you added more songs to it), you can publish again. Q4: It's harder to type on the phone, will there be an "auto-complete" as I enter the search criteria? Yes, a list of suggestions will show up as you type in the search criteria, just like the Lyric DB. Note that your songbook site is self-learning - when searching by "lời bài hát", it will remember what you searched and suggest it the next time you want to search for the same criteria. For example, if you searched for "thoi roi ta da xa nhau" and at a later time, when you type in "thoi", it will suggests "thoi roi ta da xa nhau" as a possible thing you can pick w/o having to type the whole sentence in. Q5: How often can I change my song collection and re-publish the new collection? As often as you need. When you re-publish your songbook, the old songbook will be deleted. Keep in mind that your songbook site has a "self-learning" ability (see Q4) so you will lose all those things it learned when you re-publish your songbook. Q6: I'll have a karaoke party next week, can I publish my songbook right now and send my friends my songbook address so that they can get familiar with what songs I have w/o coming to my house? Yes, your songbook is accessible anywhere around the world. If you checked "require guest password to view my songbook", your friends need to have your "guest password" to view your songbook. You can create this password in the preferences screen above. 7 users thanked Hai Lúa for this useful post. I can give that link to the people in Live Show so they can search and make request which songs I should sing next. They can just tell me the song number to punch into TKaraoke . I think the phone detection logic is broken right now so it might not display friendly on your iphone/droid. It looks nice on laptop and iPad2 though. Will fix that soon. 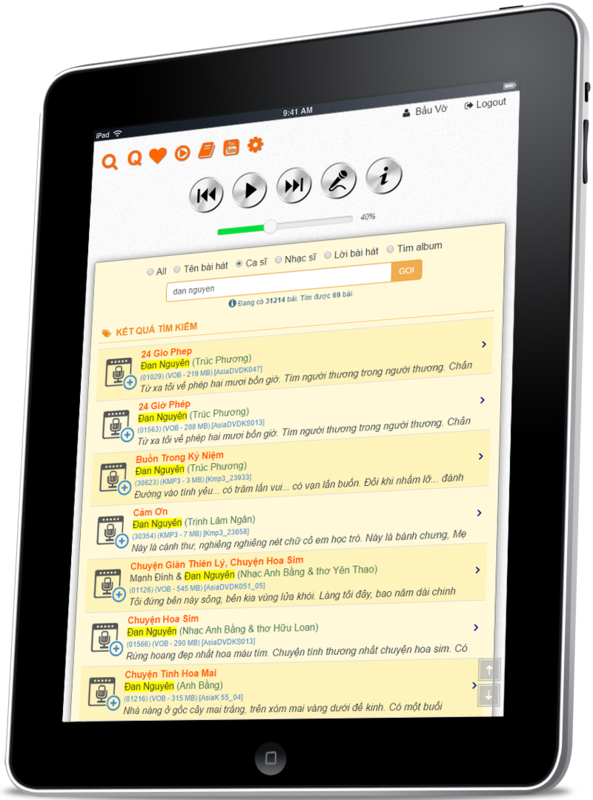 Cái song book trên không có cho songbook browse hả vcd? vi dụ như mình không biết mình muốn hát bài nào và muồn lướt qua những bài đang có. Good idea . Will need to do something instead of show all the songs because showing 23k songs on the phone is just too much for the phone. Most likely do something like "all songs starting with A", "all songs starting with B", etc. Album info is now available in the above online songbook. now just wait for it to be released with the new TK Pro! !